Introduced in 1997, the C-Leg® was the first prosthesis system to intelligently control and adapt to an individual's gait. Ottobock introduced the world to the C-Leg® microprocessor-controlled knee in 1997, and it caused an immediate sensation. Since then the C-Leg has become the most clinically evaluated and studied prosthetic knee in history, with over 40,000 people taking advantage of its proven function and stability and helping to make C-Leg technology the Standard of Care for above-knee amputees. Over that time, we’ve continued research and development efforts, and gained a lot of practical experience in microprocessor knees. We have been working toward the day when we could offer an even better solution, and that day is here, with Genium® technology. Genium is the next generation of lower limb prostheses. Easy to fit, even easier to use, this incredibly sophisticated technology opens up a whole new realm of possibilities. The Genium Bionic Prosthetic System is the result of extensive research and development efforts as well as over 14 years of practical experience with the C-Leg® prosthesis system. A breakthrough in prosthetic knee joints, the Genium is based on a completely new technology platform, fueled by advances in control technology. Ascend stairs step over step Stair ascension is possible due to additional sensory inputs, which allow users to climb stairs step over step with more natural movements. Cross obstacles more smoothly Now everyday obstacles like curbs can be stepped right over—supported by a stable, flexed knee at loading—instead of having to swing the prosthetic leg around. Walk backwards, forwards ... and more Genium detects the user’s forward and backward motion. As a result, stance will not release when stepping backwards or changing direction, giving users the benefit of safe, multi-directional mobility. Stand more easily With its new Intuitive Stance Function, the Genium can tell when the user is standing and automatically resists further flexion. This allows for a natural distribution of body weight while standing, even on inclines and uneven surfaces. Sit more naturally If the user sits for more than 2 seconds (with the thigh parallel to the ground and minimal weight on the leg) the Genium reduces resistance to take a more natural position—and switches to an energy-saving mode! 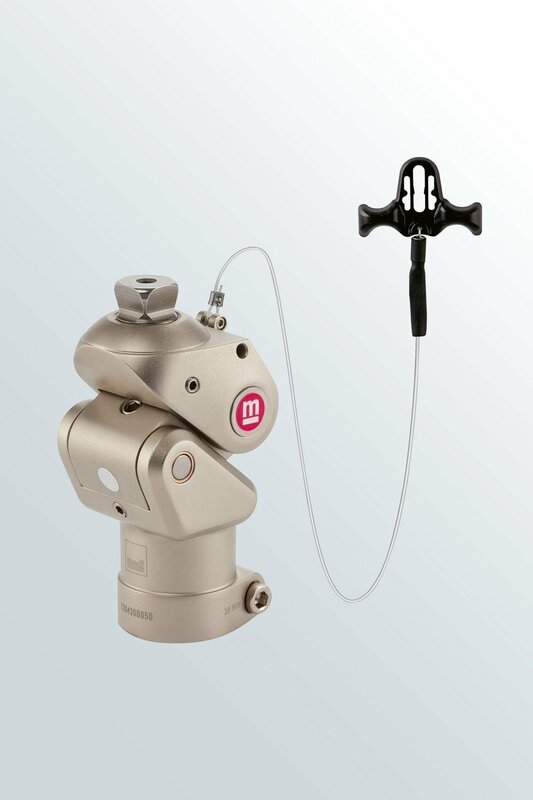 Knee joint with a 2-in-1 function. Users in the rehabilitation phase have a particularly high need for safety, which is why medi's OFM2 can be locked permanently by the CPO for the first standing and walking exercises. The joint cannot then be bent. The locking function can later be disabled as the user becomes more mobile, which makes possible a harmonious flexion and extension. If the user temporarily wants more safety, he can lock and unlock the joint himself using the dual function lever. The stance and swing phase profile of the knee joint is matched to the needs of less mobile users and can be adjusted individually. Plié 3 features more rugged internal components designed to improve durability are tested to our rigorous standards. The Plié 3 can be safely submersed in fresh shallow water for up to 30 minutes at a time.